Today, we have the debut post from the other half of Doris and Bertie, David Pollack. I don’t know about you but, whenever I pass a construction site, I always ask myself if they’re doing all they can not to kill me. Often, just to be sure, I cross the street. Well, imagine how happy I was to see this. 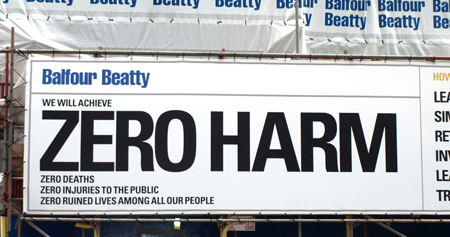 Isn’t it reassuring to know that the nice people at Balfour Beatty will achieve zero deaths. I mean, as achievements go, it’s a biggie. But really, what were they doing before the health and safety department decided that zero deaths was one of the company’s Core Attainment Strategy Objectives? Were they actively trying to kill people? “Not sure we can say we won’t ruin any lives. Not, at least, until any members of the public take residence in these balsa-wood rabbit hutches”. And what’s with the mathematical “Zero”? The words “No harm” probably didn’t sound corporate enough. But of course, that’s it. Their wanting to sound more corporate has inadvertently tipped their hand. It’s like a weak spot, a poker tell. They don’t consider us as human beings, we’re numbers on a balance sheet. Now, before you all start calling me a cynical old curmudgeon – I admit, I’m pleased Balfour Beatty are concerned with safety. But I just can’t help being a little suspicious when they have to advertise it with an enormous war headline that stretches forty feet down a busy south London street. Couldn’t they have spent the money on more safety measures. Or are they more interested in appearing to be concerned with safety? Ok, I’m cynical. They didn’t stop at telling us they are not going to kill us. They went on to explain how. I bet that would make you feel far more comfortable than being told their safety people are ‘involving’. 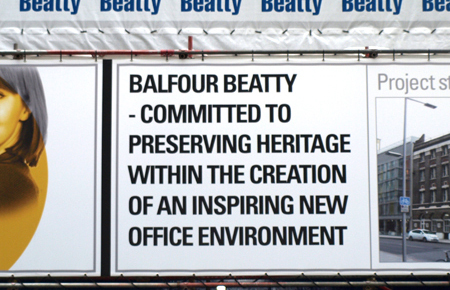 Satisfied that they’ve convinced us we’re not going to die, Balfour Beatty go on to describe the planned building. (Brace yourself: if you’re like me, the following piece of vile corp speak will send seismic shivers up and down your spine as you bristle with professional outrage). For “Committed to preserving heritage” I read, “The building is listed so we’ve no choice but to renovate it at great cost (to the subsidising tax payers). What we would have liked to do is knock the whole thing down and erect an enormous glass cube that would be of no use to anyone”. And please, who ever found an office ‘environment’ inspiring? All in all, the whole thing comes across as a breathtakingly patronising box-ticking exercise that does more to flatter Balfour Beatty’s top brass than to allay the concerns of the public. That is, it’s written for the wrong audience. A final thought: Imagine how ugly the finished building is going to be if it’s as pleasing to the eye as their copy is pleasing to the ear.